"He never met a target he couldn't take. Until today." Armand 'Blackbird' Degas (Mickey Rourke) is a Hitman that takes his job seriously, so much so that he takes no chances when it comes to leaving any witnesses behind. Carmen Colson (Diane Lane) and her husband Wayne (Thomas Jane) are having marital problems and have separated. Since he has been terminated from his current job in the construction industry, Wayne decides than he should apply to the same company that his wife Carmen is employed at. Wayne does not usually wear a suit so when he turns up for an interview, he is quickly mistaken for the head honcho at the realty company, a mistake that could end up costing him his life. Richie Nix (Joseph Gordon-Levitt) has managed to hook up with Blackbird, and the two are planning a heist against the same realty company that Wayne is trying to secure gainful employment. As Wayne waits for the head honcho to arrive, Nix and Blackbird enter the building trying to shake him down. Nix thinks that Wayne is the boss and demands the cash, but Wayne decides that he will steer Nix and Blackbird away from the building, in the hopes of diffusing the entire thing. As he gets them outside the building, Blackbirds sees some familiarity in Wayne and motions to Nix for them to leave. The heist against the realty company goes bad, and Nix makes a run for it, but not before Carmen gets a good look at Blackbird. After trying, and failing to take out Carmen, the feds get involved and offer to place both the Colson's in the witness protection program. As they looked through the Colson's home, Blackbird and Nix come across mom's phone number and go looking for her to get some leverage on Wayne and Carmen. John Madden directs this crime drama, with supporting roles by Rosario Dawson as Donna, Brandon McGibbon as Blackbird's Kid Brother and Hal Holbrook as papa. 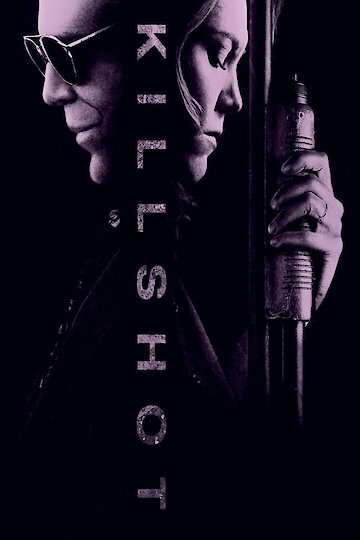 Killshot is currently available to watch and stream, buy on demand at Amazon, Vudu, iTunes, YouTube VOD online.